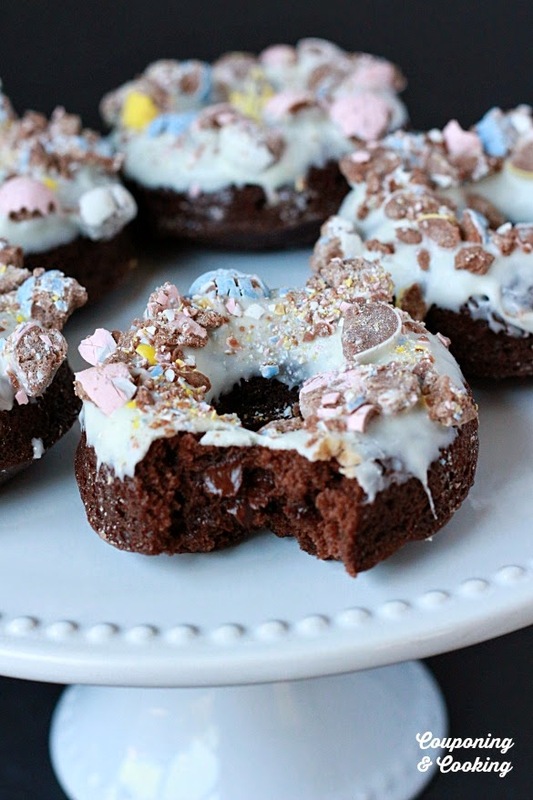 Light and fluffy chocolate donuts made from boxed muffin mix topped with white chocolate candy coating and crushed Cadbury Mini Eggs for an easy and beautiful holiday breakfast treat. With only two weeks until Easter, I would usually be done posting holiday recipes. But these were too good not to share. 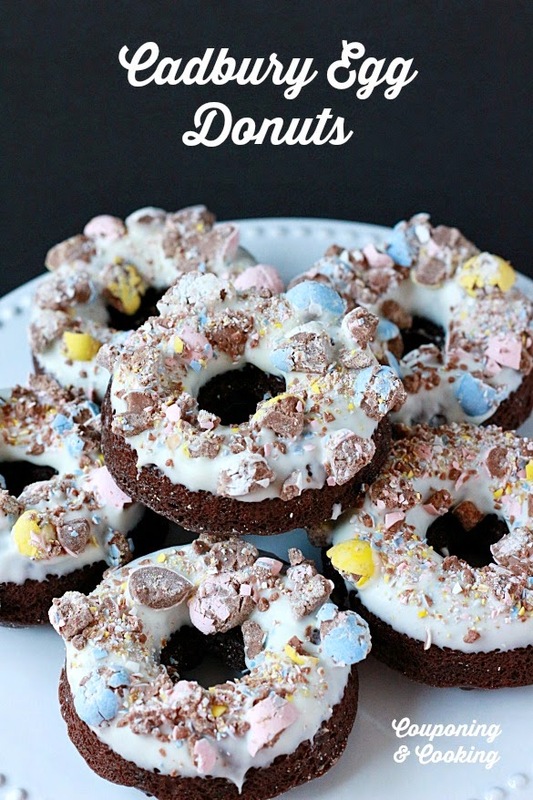 These donut have been in my head since December when I made these Peppermint Bark Donuts. They were so easy and so good that I started imagining all of the different possible topping combinations that could be used on them. And the first thing that came to mind? Cadbury Eggs. When it comes to Easter candy, I have a constant internal battle going on between Cadbury Cream Eggs and Cadbury Mini Eggs. 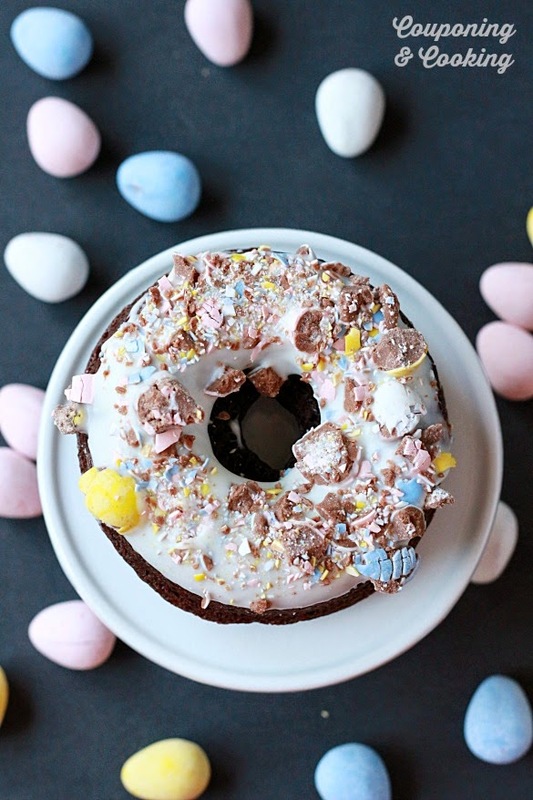 The Creme Egg is perfect for when you want one really decadent treat to satisfy a craving. But the Mini Eggs? Those guys are for when you want to snack on something sweet and crunchy while watching Grey's Anatomy on the couch in your pj's. One intense dessert vs. a handful of chocolatey bites. How to choose? Luckily, logistics chose for me in this dessert. 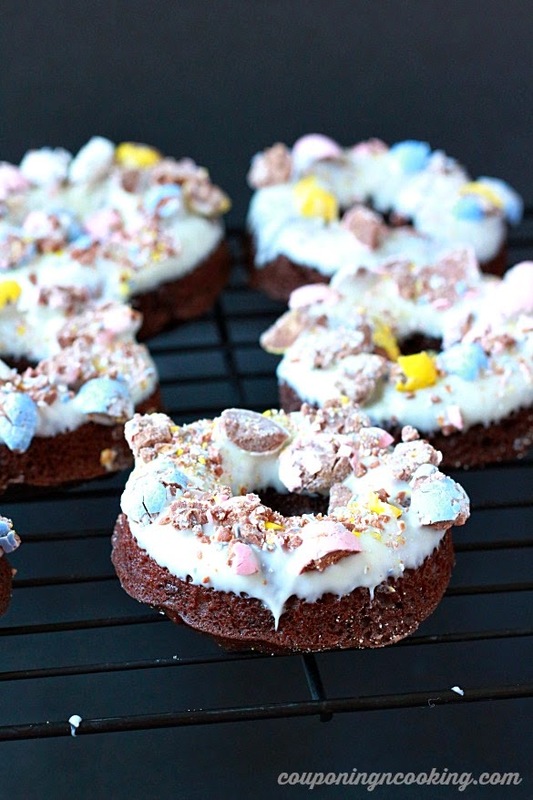 While I am sure Cadbury Creme Eggs would be over the top good on these donuts, I don't know how pretty they would look. And since everyone knows that cuteness is at least as important as taste (maybe even more important) when it comes to holiday treats the Mini Eggs won. I am obsessed with how easy this recipe is. 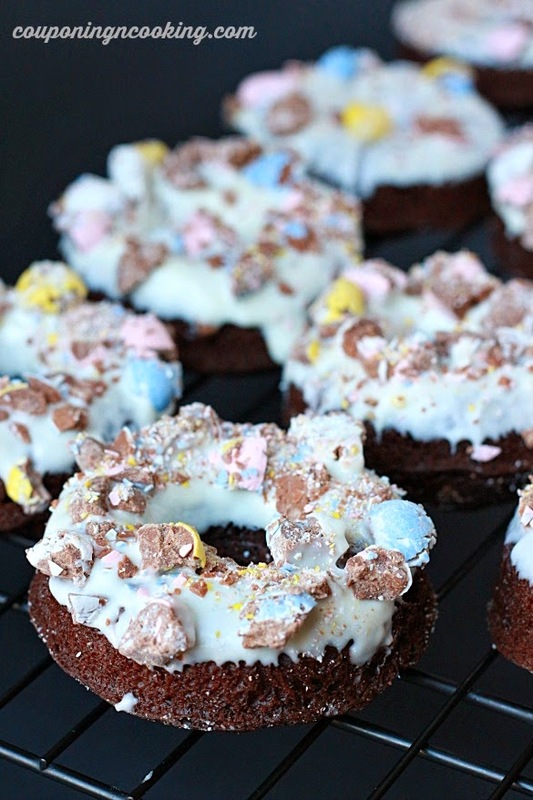 I used boxed chocolate muffin mix and baked it in my Wilton Donut Pans . I dipped the tops in Candiquik and then pressed them crushed Cadbury Eggs. The whole dozen was ready in 45 minutes start to finish (and that includes 12 minutes of baking time. 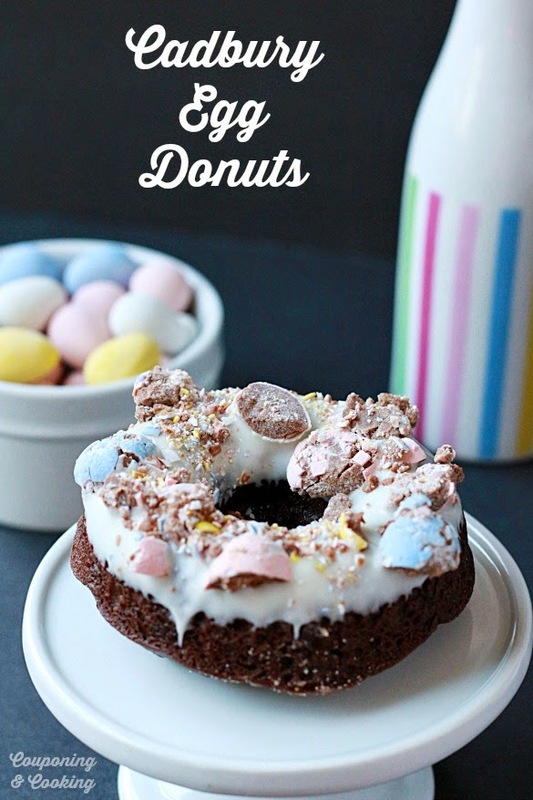 These donuts would be perfect for an Easter brunch, class party and the look adorable on a white cake plate as a center piece. 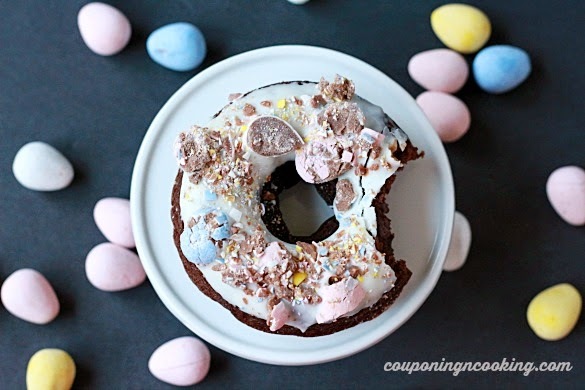 I love that you can switch it up by using different batters (boxed or homemade) and I am already thinking of all the different Easter candies I might use next time around. Reese Pieces Eggs anyone? 1.) Following the instructions on the box, prepare the muffin mix batter. 2.) Using a pastry bag without a tip or a Ziploc bag with a corner cut off and fill a donut pan with the muffin batter. 3.) Bake at 350 degrees for 10 minutes. 4.) Melt Candiquik according to the directions on package and dip the top of each donut into the melted topping. 5.) Crush Cadbury Eggs and put them on a plate. Press freshly dipped donuts into the crushed candy canes and place on a cooling rack to dry. 6.) Store in an airtight container and enjoy!